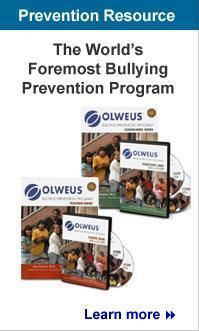 The core principles and rules of the Olweus Bullying Prevention Program can be integrated into existing children and youth programs' policies and routines. Although research has not measured the program's effectiveness in these settings, with appropriate staff training, nonschool programs may help prevent bullying and help students understand that bullying is not just a school issue, but one that impacts all areas of their lives and their communities as well. Some initial work has also been done to integrate the Olweus Bullying Prevention Program into state juvenile justice programming. For example, the state of Ohio has received a grant to implement the program in a state penitentiary for youth, which includes both school and residential components. It is also a good idea to engage your larger community in your bullying prevention efforts. Even though the majority of bullying incidents take place on school grounds during school hours, bullying doesn't cease at the doors to the school. It exists at school bus stops, community parks, summer camps, neighborhoods, shopping malls, churches, and anywhere that young people gather. Community members can help spread anti-bullying messages and efforts outside your school as well as provide support and resources to enhance the program within your building. Ideally, students should receive consistent anti-bullying messages in all areas of their lives. Seeing billboards, posters, or signs of community sponsorship or support for your school's bullying prevention program tells students that bullying is not just a school issue that is important to teachers, but an issue that is important to the whole community. Community groups can provide your bullying prevention program with different types of support, including financial, material, human, and public relations support. Groups to consider for help include your local police or fire departments, local service groups such as Rotary, Lions, or Kiwanis clubs, Jaycees, faith-based organizations, or local businesses. For example, the Chula Vista Police Department in Chula Vista, California has taken an active role in the implementation of the Olweus Bullying Prevention Program in their area schools. Police officers are an integral part of the program.